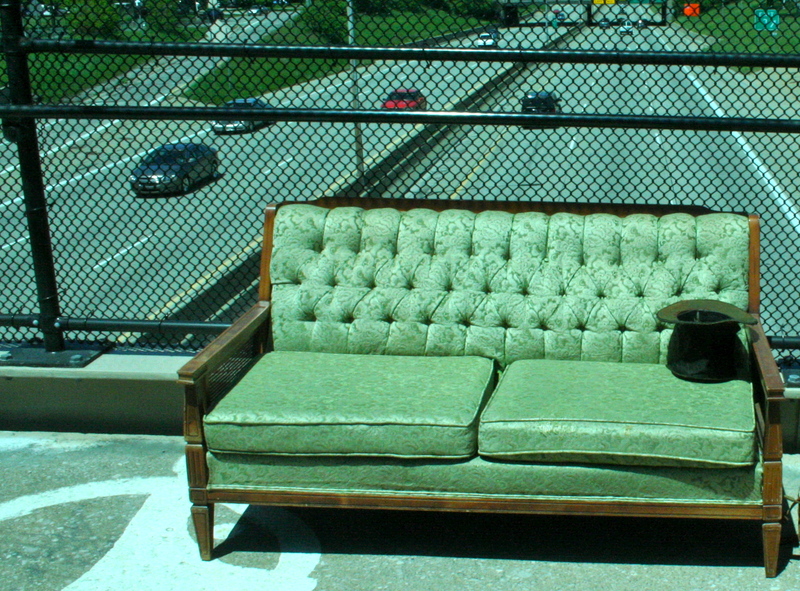 I really agonized about taking an extra year on Couches of Detroit. Being a calendar project, it’s time sensitive – good in one sense, because a deadline of some nature moderates my inner procrastinator, but difficult because a failure to meet my deadline means a full year push. No one wants to buy a calendar halfway through January (except me, apparently – somewhere in Detroit needs to carry Slingshot Organizers). I am a hasty person. Candid photography suits that. Photography in this digital age has given me the |> button to help reinforce my instinct that I’ve gotten the shot I want. It’s also easy to accumulate a lot of work quickly, provided you carry your camera everywhere (though that’s not always good for your camera). All fine and good, but you can’t rush snow, and after the fact, I discovered an unexpected twist to the calendar concept. Which is why I didn’t do anything about it for a while. 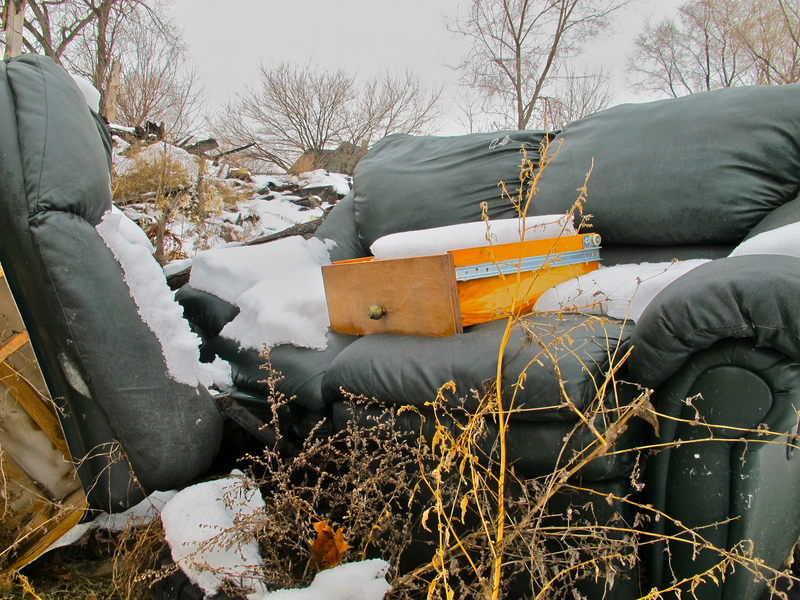 That first couch – a luscious 70s floral in brown plush, iced with three untouched inches of fresh snow – I never even got a picture of that one. I probably drove by that spot 20 times in the month it sat there, continuing to like the couch, but such is my awesome power of procrastination that I did not take its picture. It wasn’t until the couch went away that Cave Brain got sad: Where couch? 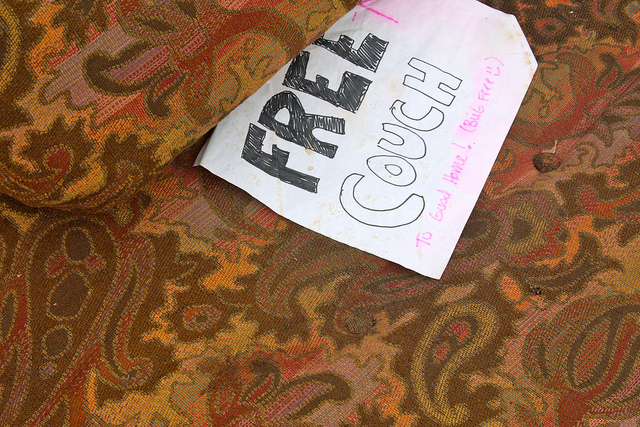 Remember couch? OK, paying attention to couches. Hey, there are lots of couches! Couches good! Maybe I will even find 12 great couches and make a calendar for 2011. Can do. But in early Fall, when a young woman’s fancy turns to laying out her Couches of Detroit calendar for 2011, she realizes the problem. Miss November is sunny! Miss February is framed in leaves. I grew up in a place without seasons, so a couch shot in August could easily look like a couch shot in November, but here is different and couches different now! Adding an element of time to my photography project created a new ripple, and different thinking about the nature of a calendar made me realize Couches of Detroit was not remotely complete without the lovely Misses of winter. So, another year. I said I was hasty. I know. I regret how quickly I did 50 States, could have done it better (and maybe still will – at some point I have to give my massive archive of photos of that trip more than a cursory and sleep-deprived glance). I have to give myself permission to take more time with my projects, even when (as was the case with 50 States) I have patrons invested in my output. It’s good to produce work and you can’t make a living without making deadlines, but it’s bad to rush something too quickly into production. Our insta-culture often loses that. Yesterday I took a really good picture of a couch. One that made me feel justified taking an extra year to do this calendar better. Make it as good and meaningful as I possibly can. The snow here is so cheap, it’s practically free. You just gotta wait for it. *You can read more about this project on House of Bedlam.